The camp began on Sunday night with cultural activities that included indigenous dance, rock painting, indigenous singing, artefact designs and mural painting. On Monday the girls started the morning with "A Walk Together" with all Academies and Staff visiting Kings Park Lookout. 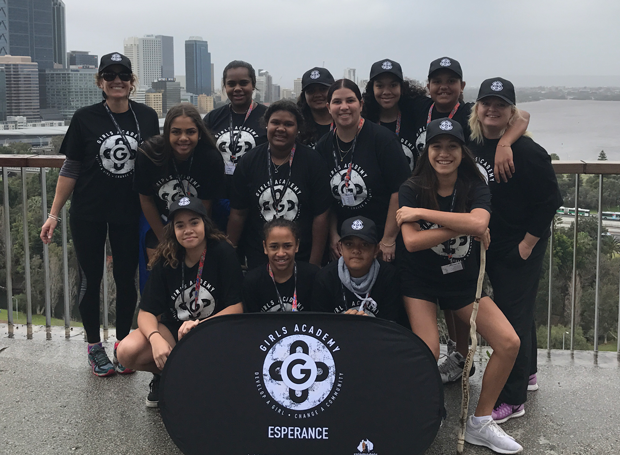 The Walk Together was to raise awareness about the gaps in educational outcomes for Aboriginal Women. ABC Radio and Channel Nine interviewed some of our girls. The rest of the day was spent at the Ern Halliday Recreation Camp participating in adventure and team building activities. A delightful lunch was had at a nearby Chinese restaurant. That night the girls went to Morley bowl for dinner and bowling. Tuesday was a full day of basketball competition at Curtin University. Our girls were fierce competitors and made it into the semi finals. The girls also indulged in free massages and strapping provided by the University students! Wednesday was back to the university for a tour and cultural and employment activities with university representatives. The girls then watched the showcase grand final between Kalgoorlie and Clontarf. Presentations were held and the All Star team was named - Zaleema Bourne from ESHS made the All Star team. Ricky Grace, the Girls Academy CEO, and various corporate sponsors presented awards. Dr Robert Isaacs conducted the Welcome to Country and a gave a speech that included some Girls Academy history. It was a tremendous camp and we look forward to the continued growth of our new Girls Academy.